Retextured HP banners. In time for Christmas for my HP loving GoS buddies. My Retexured versions of Tiggypums Banners just in time for christmas. I enriched the textures with heavy weaves to soften their look. Click to download. Meshes included. Hello, hello, I know it's been a while since I've posted anything so I thought I'd share some eyes I made with all of you. 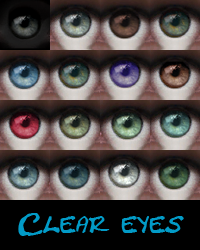 I call them Clear Eyes, because they're fairly clear. I did most of the work by hand then lightly blended them with an E-studio eye texture I had lying around and slap pooklet's Sclera on them. Lips I blended for general use on sims of both genders. They were very useful and faithful. They never went in to the future and fucked my women. And a produce market I made when I have no pictures of because I had just finished it before I left. =/ I hope YOU get to enjoy it at least. It's kinda grunge and vintage with some plants around and trash. Various other clutter. If someone wants to send me a picture to put up, even if it's just a screen cap I can do all the editing and resizing, I would be grateful. Grey Uniforms for TF and AF. I plan to use them for my Harry Potter sims because I like movie grey more than book black. TF Mesh by Cloudless included, AF requires freetime. Hearing Ready To Go! - Melody. Well, I'm married now. And the honeymoon was a dream, and the afterglow of that European fantasy still lives on. However I've been busily back to work. And since he works hours (and Hours, and HOURS, AND HOURS) longer than I do, the sims has began to occupy my free time once more. 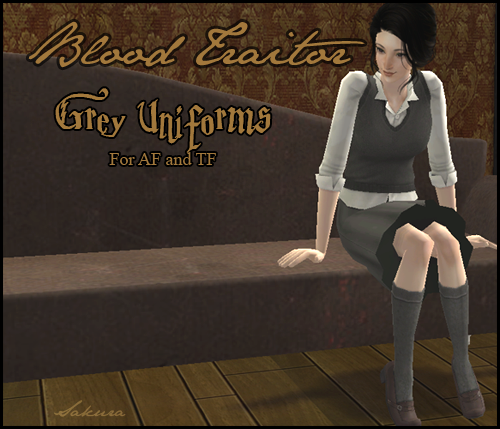 I have a small pic spam for your first and then some grey uniforms I made FOREVER ago, that I've just now uploaded. Hearing Glory Of Love - Melody. I love the sims 2. And Dragon Age, Mass Effect, Team Fortress 2, Dr. Who, Downton Abbey, Skins, Harry Potter, and Comics. Don't put my things or things made from my things on any paysite. Use personally how ever you want. pooklet color action the hell out of everything.